The month of love is here – have you decided on a special treat for your loved one for Valentine’s? No fear, City Sightseeing is here to the romantic rescue! There are few things more romantic than watching the sun go down with your true love at the end of a beautiful Cape Town day. So hop on the City Sightseeing Sunset Bus this February and celebrate the month of love in a fitting fashion! See the best sunsets in Cape Town with City Sightseeing and the Sunset Bus. Departing every day until 1 May 2018, the Sunset Bus is the perfect solution for working couples looking to relax after hours. The bus departs at 5.30pm from stop 1 at the V&A Waterfront and returns approximately three hours later. This is not a hop-on, hop-off tour; instead, the bus takes you on an afternoon drive showing off the best views Cape Town has to offer at sunset. The trip ends at the top of Signal Hill where guests are encouraged to pack a picnic and blanket to enjoy watching the sun as it disappears behind the Atlantic in a storm of vibrant colours. After enjoying your romantic appetisers and as darkness falls, the bus will take you back to the V&A Waterfront. Why not complete a special evening with a delicious meal at one of its award-winning restaurants? Den Anker is famous for its exquisite Belgian and international cuisine and extensive wine and beer list. Set in a beautiful Victorian house, the harbourside establishment offers some of the best views of the Victoria & Alfred basin and Table Mountain towering behind it. If fresh seafood and a view are what you’re looking for, the Greek Fisherman is the place to go. The restaurant is one of the oldest at the V&A Waterfront and has been a favourite for visitors for the past 25 years. Order one of its famous meze platters for starters and the seafood platter to share with your loved one – you won’t be disappointed! 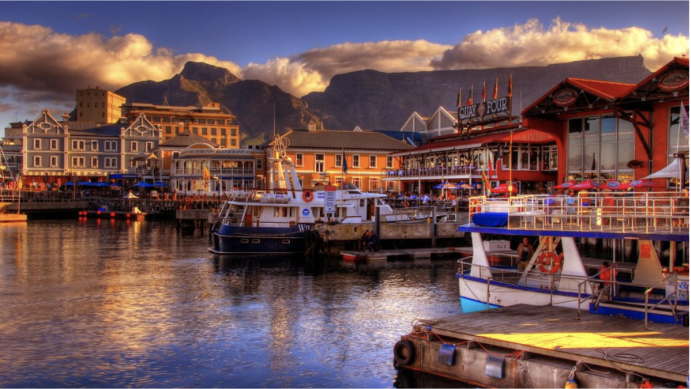 Think the freshest ingredients, gourmet dishes and a seat right on the V&A Waterfront harbour. Surrounded by yachts and luxury, Harbour House has it all. Ideal for a special romantic meal, this elegant venue will exceed all expectations. Linger upstairs at the trendy cocktail bar for a decadent toast before taking your seat downstairs for a memorable meal. What to know about the Sunset Bus?